Fall Is almost here and that means pumpkin and apple picking. With many large farms, petting zoos and activities for children this fall -- why not spend a weekend in the Northfork and enjoy all it offers. 2 bedroom cottage sleeps 4, plus. 5 minute walk to private beach on Long Island Sound! Full kitchen, one bathroom, Master BR w/queen bed , skylight; 2nd BR w/bunk bed. Living room with a/c, flat screen, wood burning stove, Cable TV, Wireless Internet, on 2nd floor. Large private deck with table, chairs, wicker conversation set, gas grill, parking. This community was once camping / tent grounds where many families would come and spend time together in the warmer months. Just minutes from several local farm stands - boasting glorious local fruits and vegetables, Tanger Outlets, 10 mins to Splish Splash Water Park, fine dining and wineries, 5 minutes to ocean beaches, East Wind Day Spa, Steps from Baiting Hollow Club - 18 Hole Golf Course and many local wineries. Come and spend time with the family, get to know our friendly locals. Play on the private beach or just bask in the sun with a book. Girl's weekends, family getaways, beach vacations or any reason, who doesn't want to spend time close to the beach for the same rate as a hotel? Enjoy the small town country feel on the north fork - and everything from fabulous wineries for couple and singles fun to country charm in farm stands with veggie's and pies and fun for the whole family. Our cottage is up on the bluff of a quiet private community. (photos to be updated)Cute, well maintained 2 BR, 1 Bath Cottage for rent. Steps to the beach. Summer rental available also on a long term basis. Available most weeks from 4/15-10/15. Contact me for details. Please bring your own beach towels; beach towels are not provided. The cottage in Woodcliff was just perfect for my wife and I to get away from the city for a couple of days. The place was very clean, quiet, and comfortable. The walk to the beach was only a couple of minutes and the water still warm at the end of September. We didn't have a car but that was no problem at all; we took a car service from the train station, having bought groceries before. Within a twenty minute walk of the cottage is a farm stand where you can buy fruits and vegetables and a little further, a winery for wine. We had a great time and Maria was very helpful whenever we had a question about something. Thank you so much for your beautiful review. I am happy you enjoyed your time at the cottage. It is such a pretty and relaxing environment. Hope you stay again soon. Cozy cottage with everything we needed and wanted! 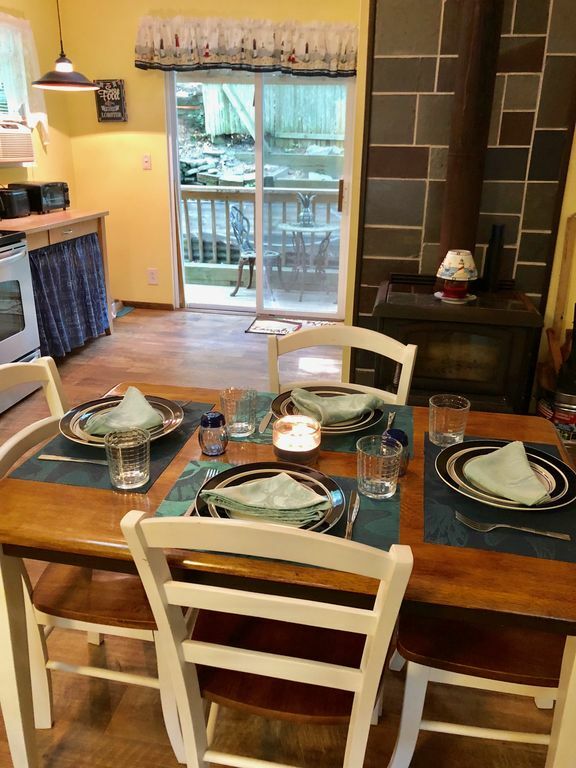 Cozy cottage, walking distance to the beach! Had everything we needed and plenty of space for our family, with two growing boys (ages 5 and 11) for a family getaway! Thank you Aaron. So glad you enjoyed your stay. It was a pleasure having you as a client. Thank you for cleaning up, we really appreciate it. Thank you so much it was really a pleasure having you. The home was cozy and clean with a great outdoor space. Working fireplace was perfect for a surprisingly chilly night. We loved the location and morning walks on the private beach - which we had all to ourselves even on a weekend at the end of June. Great location for exploring Long Island. Highly recommend the Riverhead Ciderhouse just up the road! thank you very much for your wonderful review. It was a pleasure having you stay at the cottage!